The 2019 Goodwill Parcel Project visit to the DRC. 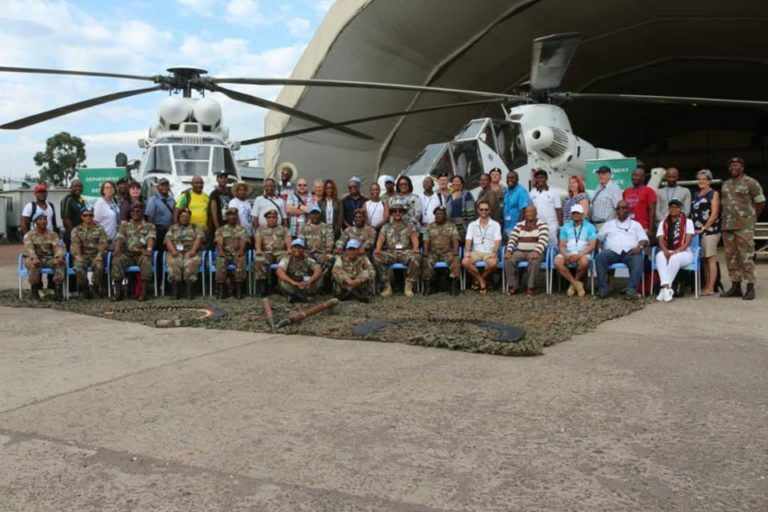 South African National Defence Force (SANDF) soldiers deployed with the United Nations Force Intervention Brigade (FIB) have been receiving goodwill parcels from a visiting delegation, which arrived in the Democratic Republic of Congo (DRC) last week. During the goodwill parcel handing over ceremony held at IHUSI Hotel in Goma on 14 March, the Acting Chairperson of the civilian arm of the parcel project said the project has grown exponentially ever since it was launched in 2001 when R25 000 was raised – in 2018 this had increased to R3 million, donated by 19 companies. In addition to the parcels, other items were handed over which included books, soccer kits, chess boards, and darts to keep soldiers busy when not deployed on operations around Goma and Beni. The leader of the Goodwill Parcel Project (GWPP) delegation, Brigadier General P. Mavhungu, reminded the South African forces that they are greatly appreciated at home. He told them to continue to serve the country with dignity and dedication and urged them to help stabilize the African continent, according to the SANDF. “You have a very significant role to play in supporting the United Nation operations in the DRC. Your main focus must be to support the FIB in Eastern DRC. The FIB Commander needs your support. I know the situation is currently volatile in Eastern DRC and the fighting is happening almost daily,” Mavhungu said. He also touched on the issue of discipline. “We know that your deployment is long but that does not mean you must lose focus.” He urged the South African soldiers to make their country proud and never compromise on discipline. The delegation also included the Director Defence Corporate Communication, Brigadier General Mafi Mgobozi, Director Human Resources Service at the SA Air Force, Brigadier General Mongezi Kweta, Sergeant Major of the Defence Force, Master Chief Warrant Officer Mothusi Kgaladi and representatives of the GWPP sponsors. The GWPP is designed to lend a hand of support to deployed SANDF members and appreciate the good work they are doing in pursuance of stability and peace across the continent and within South Africa’s borders. The team left South Africa on 11 March and was expected back in the country on 15 March, the SANDF said.